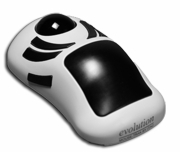 Mouse Trak Evolution ergonomic trackball Mouse is designed for use in ergonomic office settings, evolution will not always be comfortable for use on traditional desk setups. We strongly recommend that users pay attention to the ergonomics of keyboard and mouse positioning whether using a MOUSE TRAK or any other input device. If you do have a desk arrangement that allows your keyboard and mouse to be at the height of your elbow when your arm is hanging relaxed against your side, then you are ready for evolution. For you, the evolution MOUSE-TRAK doesn't just look like it's ergonomically designed. It proves it in several key features. By rotating the thumb to a slightly higher position than ordinary devices do, the evolution ergonomic trackball positions the hand in a comfortable, low-stress configuration. The buttons - specially designed curved bars, in this case - fit readily to natural, relaxed hand and finger positions. It's comfortable to use. The user doesn't "grasp" the palm pad of the evolution MOUSE-TRAK, but a few moments of experimenting will help the user find the most comfortable position for him or her to rest the hand on the pad. This will differ among persons depending upon the size of the hands, length of fingers, etc. 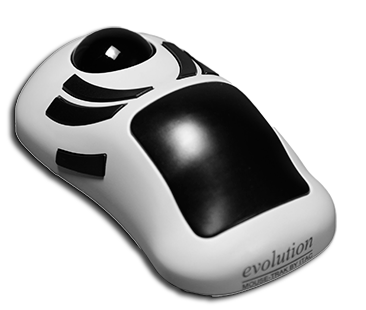 The materials used in the manufacture of the evolution MOUSE-TRAK were chosen not only for their sturdy characteristics, appropriate for use in general office or production environments, but also for their cushioning effects on the wrist and hand. When users are trained to perform tasks, they think in terms of events. Point here, click here, enter data, etc. Typical mouse technology, however, complicates this process slightly by requiring the user to perform one action for some events, and two for others-click, double click. Is that double click one event, or two? With the evolution MOUSE-TRAK, there are two buttons closely associated with one another that provide these separate functions. One button performs the single click function. The other button performs the double-click function. It cuts down on repetitive motions, associates one event with one action, and simplifies the user interface. Once the user makes the quick adaptation to the new, more usable interface, it becomes entirely intuitive and speeds up user actions with the point-and-click device. The user can switch from the pre-configured right-hand operation mode to left-hand mode in a few seconds, without changing the control panel setup. A simple key-chord lets you enter programming mode and then send the simple sequence command to change the settings. To let you know you were successful, the evolution MOUSE-TRAK even acknowledges your programming with a sequence of tones. Not only is right/left-handed operation programmable, but if the user has special needs or preferences, all six of the buttons on the evolution MOUSE-TRAK are programmable without the use of special software drivers. Furthermore, it's just as easy to return to default settings. In truth, ITAC’s president recommends enlisting the 12 year old who programs the VCR clocks in your neighborhood if you want to reprogram the keys other than setting them to left/right hand factory defaults. But, if for some reason the 12 year old is not around, you can always refer to the Button Programming Instructions. Many early users like customizing the key program. The most common change we have heard of is to swap the position of "primary click" and "primary double-click". The evolution MOUSE-TRAK was designed to be used in places that would gum up a typical mouse or trackball in no time, but it may get dirty from normal use. Because it provides such an extremely smooth action, users quickly notice the effects of "stuff" getting on the shafts. With cheaper trackballs the ball movement is so stiff and irregular that users don’t realize that something is going wrong! Anyone who has ever worked with a mouse knows that they attract dirt, fuzz, lint, and other "stuff," which can cause ball movement to feel rough and may inhibit normal cursor movement. When this happens with the evolution MOUSE-TRAK, the user doesn't ordinarily have to disassemble the device to clean it. Simply spin the ball as hard and fast as possible at each diagonal, which will cause the dirt to fly off into the case, and then press down on the ball and move it in a circular motion to further clean the shaft surface. Elevated integrated hand support for maximum stress reduction. Six large keys positioned to fall under the fingers. Click, Double-Click, and Click & Drag without complicated driver setup. Extremely light ball movement force reduces user effort. Advanced users can reprogram the keys for single stroke Click, Double-Click, or Click & Drag for any of the three industry standard mouse keys without special drivers. evolution is ambiguous and can be configured for left or right handed users. Reliable stainless steel shafts and bearings. evolution is big. In fact, it is so big that it uses nearly half the space required for your old mousepad. FCC Class B and CE Mark certified. Resolution: 160 to 480 pulses per revolution of the ball.